Portofino granite is quarried in Brazil. 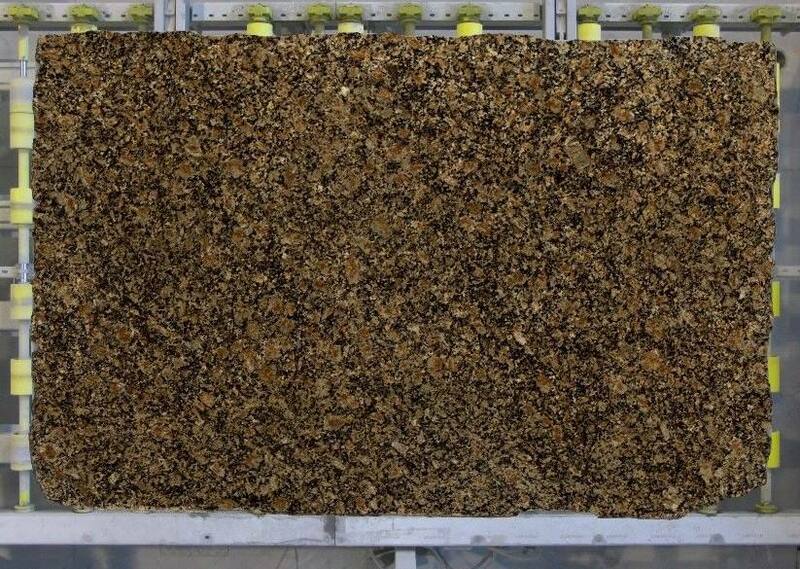 It is a brown stone with patterns of black, brown, and beige minerals throughout the slab. There is not a lot of variation, but you may find a slab that has much more brown or black than normal. Portofino granite has intense black minerals when you get a closer look. The stone has some lighter beige tones which help lighten the stones overall appearance slightly. The various brown colored minerals are more apparent up close for an amazing effect. The brown deposits can range from a metallic copper brown to dark brown in some sections. The darker browns simply accentuate the already stunning color combination of the light brown and blacks in the stone. There are tiny little quartz crystals embedded in some sections that glisten and sparkle when light touches the surface. When combined with light colored cabinets, the Portofino granite countertops really stand out. The dark black and brown colors are a perfect contrast to the light cabinets. When combined with lightly stained wood cabinets,the countertops blend effortlessly into the room. The black becomes almost understated, with the lighter mineral deposits standing out. If you pair it with dark cabinets, then your countertops will be the understated. The black of the stone seamlessly blends in with the darker cabinets. The lighter brown tones accentuate the countertops creating a unique and overall dramatic effect.